London welcomes another world-class sporting arena to its ranks tonight as the new Tottenham Hotspur Stadium opens its doors. 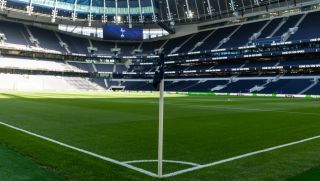 Home of Tottenham Hotspur FC, better known simply as Spurs, the new ground will host home Premier League matches for the club alongside regular NFL and Premiership Rugby games, making it one of the capital’s top sporting attractions. Now, after years of building work, the club is set to start its new era with the first match at the new stadium tonight versus Crystal Palace. TechRadar Pro was invited to get a preview of the ground earlier this week, getting behind the scenes access to one of the capital’s biggest ever sporting projects. Spurs first announced a major redevelopment of their White Hart Lane ground back in 2012, with the projected suffering several delays and a reported doubling of its building costs - with the new stadium believed to have cost around £850 million, slightly more expensive than the £789 million to build Wembley. The new 62,062-capacity stadium is a major landmark in what is one of London’s poorest boroughs, and the club hopes it can help spearhead local development as well. White Hart Lane had been Spurs’ home for 118 years, and having been built literally on top of the old ground, rather than relocated miles out of town as with many clubs, the new stadium has a vivid desire to not only remember the past, but celebrate the future. The floors of the new stands feature repurposed material from the old ground, a plaque in the South Stand marks the old centre circle spot, and there are nods to the team’s past successes everywhere. But the Tottenham Hotspur Stadium looks to offer fans more than ever before, with nearly a thousand square feet of video screens around the stadium, more restaurants and bars than the previous ground (including Europe’s longest single-serve watering hole, the 65m Goal Line Bar), and a cashless payment system that should cut down waiting times in that 15-minute half-time window. But inside the new stadium is a wealth of technology that the club helps will maximise the matchday experience, becoming a shining light to sporting arenas around the world. HPE was selected by the club to provide Wi-Fi connectivity back in 2017, and using its Pico Cell technology, has deployed 1,641 Wi-Fi access points under seats in the stadium - equivalent to one per 75 seats. Backed up by over 1,200km of networking cable, this will provide what HPE says is “100 percent Wi-Fi coverage” - all completely free for fans to use. Fans will also be able to benefit from the company’s technology in the official Spurs app, which uses 700 HPE Bluetooth beacons to provide location services that will help fans find the nearest bars, restaurants and retail outlets to their seats. HPE’s Core Wired Network infrastructure enables the stadium's critical services, such as CCTV, Building Management Systems, Retail, Audio Visual and Access Control, to function under times of great stress, such as matchday, meaning that the fan experience should never be affected - unless the team is losing of course. “Technology is the essential foundation for the fan experience, providing a fully immersive environment that is at the heart of the stadium’s vision,” says Marc Waters, HPE managing director UK & Ireland. HP technology can also be spotted around the stadium, with company supplying all the computer hardware and printer devices, including 600 retail point of sale (POS) systems, desktop and notebook PCs, commercial printers and display monitors.